As part of the City of Markham’s 2020 planned growth strategy, the Flato Markham Theatre played host to an installment of the process in April that saw York University president and vice chancellor Dr. Mamdouh Shoukri, along with Seneca College president David Agnew, lay out some new details about the coming York University location that will eventually see over 4,000 students on a Kennedy & Hwy 407-area campus. 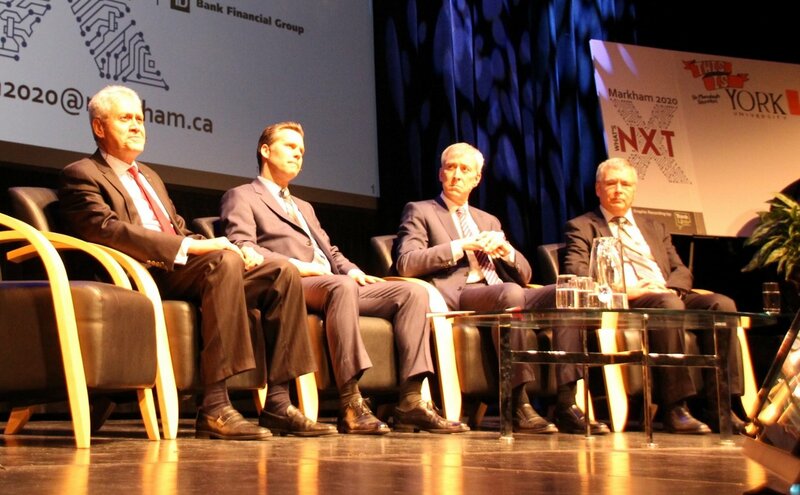 Shoukri and Agnew, speaking to a full house of business leaders and joined onstage by Mayor Frank Scarpitti, economists Derek Burleton of TD Bank and Warren Jestin of the Scotia Bank, explained that the planning process is well underway and noticeable change will come to the land immediately west of the Markham Pan Am Centre sooner than expected. Beginning with a 10,000-sq. ft. office in Markham Centre as early as this year, Shoukri said it was essential to get on the ground in the community quickly to start. The space, dubbed an “innovation hub” will, in addition to housing administrative staff, will offer lecture series to the community, incubator capacities to develop businesses of both York students and from the Markham business community. It will even include cooperation with York region high school initiatives. He estimates the campus will produce $500 million in community benefit through construction, addition of 400 new jobs and $37 million in annual impact. The formal construction of the first campus buildings won’t begin until early 2018 with a full campus opening in late 2020 or early 2021. Seneca’s Agnew outlined his college’s plans for the new campus. Seneca will be a partner in developing the York campus, contributing its own roster of courses there as it does on the main Keele and Steeles campus. Agnew notes that the cooperation between York and Seneca involves the highest number of shared students in Canada, with students often earning diplomas and degrees in one integrated process, gaining important cross-discipline credentials that are key to students’ and the institution’s success. It realizes what he refers to as an “evolution of the system.” This includes technical skills to do the job but also the ability to think critically and be able to adapt to the reality of constant change that will typify current student’s future. You can view the Markham 2020 plan and other related plans under the Business & Developments tab of www.markham.ca.